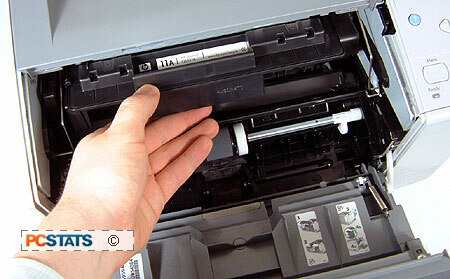 The LaserJet 2420dn printer comes with the toner packed separately, as is usual for these types of printers. Once you've removed the various bits of tape and padding that secure the printer for transport (as detailed in the instruction foldout) all that remains is to unpack the toner cartridge and insert it into the printer. The cartridge slides smoothly into the body of the printer and locks firmly into place. 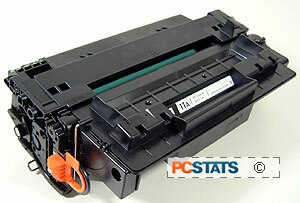 The only problem was, the first HP 2420dn printer refused to recognize that the cartridge existed. We ensured that everything was placed correctly and tried again several times, but no go. The installation process seemed straightforward, as you'd expect from a modern printer. We did find that it took a little longer than expected though, probably because of the documentation and other files included with the driver install. Network installation was also easy, though slightly more involved. The printer defaults to acquiring its IP address from DHCP, but as we were not running a DHCP server on the test network, we needed to manually configure an IP address and subnet mask on the HP LaserJet's 2420dn's menu system before we could perform any of the network installation. Once that was done, the installer scanned the network and detected the printer correctly. We were also given the option to change the IP address of the printer through the installation program at this point. One interesting feature that we noted on the included installation CD is the presence of an optional 'installer customization wizard' which allows you to create an answer file for a customized installation. This allows system admins customize printer options like quality, duplexing, etc. before the drivers are installed, then easily install the printer on many different systems without having to set the same options on each separate box. Great for 'hands-off' offices where the system admin does not want ordinary users messing with his or her printer settings. Choosing this option runs the install process and creates a directory holding the necessary installation files for copying onto the media of your choice. The install process was a little more interactive than most, as the CD for the HP LaserJet 2420dn comes with a host of extra features like a PDF manual and additional fonts, guides and tools which can be added during the installation. You can also configure printer settings like duplexing and print quality during the installation process.